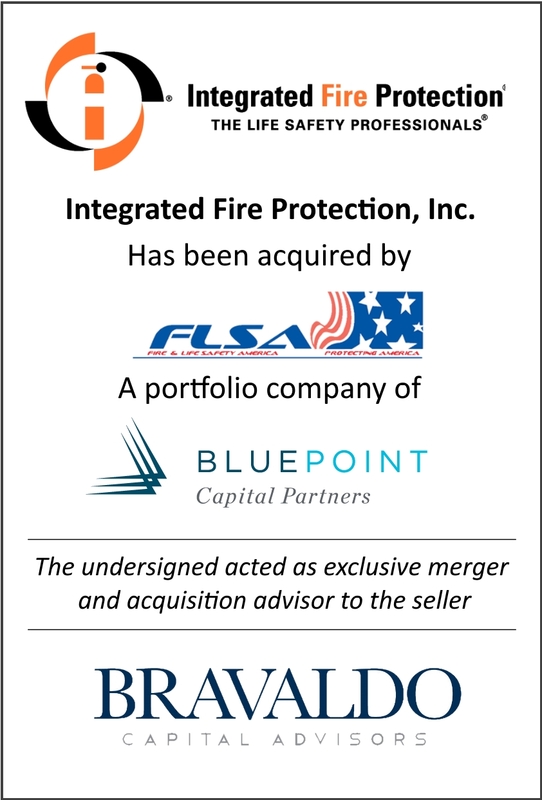 December 1, 2017 – Bravaldo Capital Advisors, Inc. (“BCA”) is pleased to announce the successful sale of its client, Integrated Fire Protection, LLC (“IFP”), a Norcross, Georgia based leading total solutions commercial service provider for fire and life safety needs, to Fire & Life Safety America, Inc. (“FLSA”), a leading provider of fire and life safety system inspection, maintenance, repair and installation services and a portfolio company of Blue Point Capital Partners. Integrated Fire Protection, LLC (www.integratedfireprotection.com), founded in 2002, is an industry-leading, full-service provider of fire protection and life safety services, including inspection, testing, maintenance, and installation of fire sprinklers, fire alarms, and special hazard systems. IFP has built an outstanding reputation as a total solutions provider committed to delivering quality products and unparalleled service. Based in Norcross, Georgia, IFP has a strong presence throughout the greater Atlanta metro area, and has served clients across the southeastern United States. Fire & Life Safety America (www.flsamerica.com), founded in 1997, is headquartered in Richmond, VA, and one of the nation’s largest fire and life safety services providers. FLSA serves a diverse base of recurring inspection and monitoring accounts and has been recognized in the fire and life safety industry for maintaining excellence through rapid growth and development. FLSA services customers from eighteen branch locations in the mid-Atlantic and southeastern United States, as well as an established national partner network. Blue Point Capital Partners (www.bluepointcapital.com) is a private equity firm managing over $825 million in committed capital. With offices in Cleveland, Charlotte, Seattle and Shanghai, Blue Point’s geographical footprint allows it to establish relationships with local and regional entrepreneurs and advisors, while providing the resources of an international firm. The Blue Point group has a 27-year track record of partnering with companies in the lower middle market to facilitate growth and transformative change. It is one of only a few middle market private equity firms with a presence in both the United States and China, which provides a distinct advantage for its portfolio companies. Blue Point typically invests in manufacturing, distribution and service businesses generating between $20 million and $200 million in revenue.